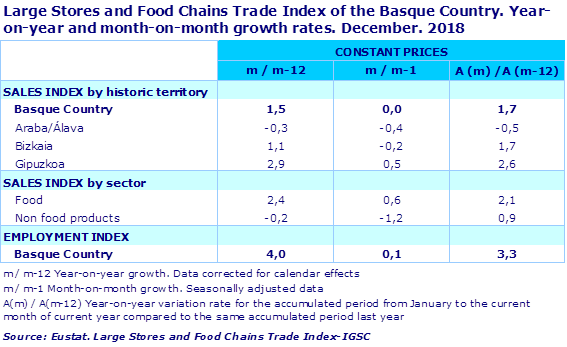 Sales at large stores and food chains in the Basque Country in December 2018 experienced a year-on-year upturn at constant prices of 1.5% in homogenous terms of the working calendar, according to Eustat data. Compared to November, sales remained unchanged (0.0%) in deseasonalised terms. Sales of food products at large stores and food chains reflected a rise of 2.4%, and sales corresponding to other items experienced a downturn of 0.2%. There were rises and falls in the provinces: Álava saw a fall of 0.3%, whereas in Bizkaia there was a rise of 1.1% and in Gipuzkoa sales were up 2.9%. In the accumulated total for the year, sales in large stores and food chains in the Basque Country were up 1.7% with respect to the same period of the previous year, in homogeneous terms of the working calendar and at constant prices. In this period, food sales saw a 2.1% upturn overall and other products saw an increase of 0.9%. By province, in Gipuzkoa sales over the year as a whole rose by 2.6% at constant prices and with respect to the previous year; they were also up by 1.7% in Bizkaia, however in Álava a 0.5% fall was recorded. The number of individuals employed in large stores and food chains in the Basque Country rose by 3.3% in 2018 compared to the previous year.